An easy recipe you can make ahead (and even freeze!) for breakfast on-the-go or a simple brinner! Preheat your oven to 350°F and coat a 12-cup muffin tin with nonstick cooking spray. Divide the broccoli and ham between the cups in the muffin tin. Top each with a slightly heaping tablespoon of cheddar cheese. Crack the eggs into a large bowl, add the dry mustard, kosher salt, and pepper, and lightly beat. 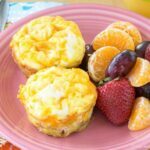 Divide the egg mixture evenly between the muffin cups. You'll need about 1/4 cup of the egg mixture for each one, but it is easier to add about half of that at a time and let it soak down into the cups.